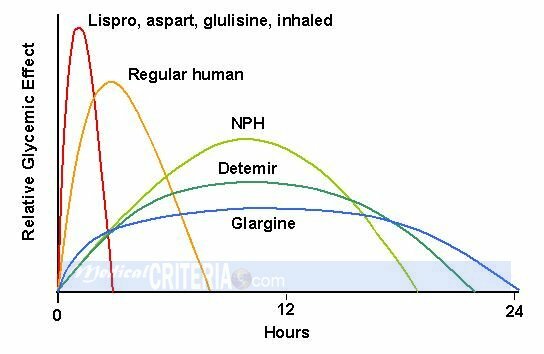 Each insulin preparation has a different pharmacokinetic profile, i.e., onset, peak effect, and duration. aGlargine has minimal peak activity; detemir has some peak activity at 6–14 h.
bDual: two peaks; one at 2–3 h; the second several hours later. Jonassen I, Havelund S, Ribel U, et al. Insulin degludec is a new generation ultra-long acting basal insulin with a unique mechanism of protraction based on multi-hexamer formation. Diabetes. 2010;59(Suppl 1):A11. This entry was posted in Diabetes and tagged detemir, diabetes, farmacocinetica, glargina, glargine, glulisina, Insulin, lisproglulisine, nph, Pharmacokinetics, pharmacology, Preparations by Guillermo Firman. Bookmark the permalink.